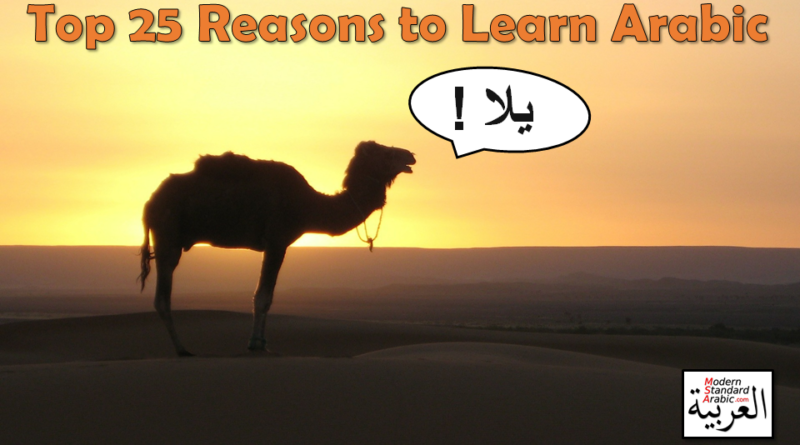 Here are 25 of the top reasons to learn Arabic. 1. Arabic is spoken by more than 280 million people as a native language. Total speakers almost total half a billion. If you count Hindi and Urdu together, Arabic is the 4th most spoken language on the planet. You will have plenty of people to talk to in this world. 2. Arabic is the literary language of over 1 billion Muslims. This language is quickly growing, and is constantly in demand. 3. Arabic has fun sounds. Where else can you find the ‘ein and the ‘ghein, mixed with the khaa? This stuff is legend. 4. The Arabic culture is rich in history and diverse. This language goes back, and I mean waaaaay back. Spanning across continents, the mix of dialects and culture is a major bonus with this language. 5. Arabic MSA is a bridge language. Many other cultures have been influenced by Arabic. 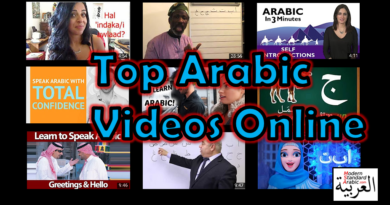 Not only do you get insight into the entire Arab world (dozens of countries), you gain insight into Urdu, Turkish, Hebrew, etc. The Persian (Farsi) vocabulary is almost 50% Arabic! 6. The Root System runs deep. 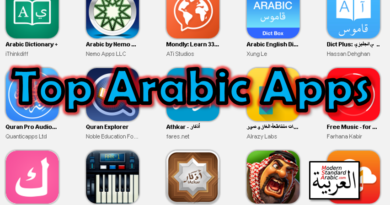 Learning the Arabic root can derive a group of related words. You bag dozens of words from the simple root. What a bargain! 7. Arabic is not isolated to a country. Many of the world’s languages are isolated a specific country. Arabic didn’t pay attention to the borders, and went intercontinental. Few languages offer this diversity. 8. It is Relatively Easy to Learn. In time, you may accept this. Sure, the letters may seem intimidating, but the letters and language are not that difficult. The alphabet (thank your stars it has an alphabet… yes, Chinese, I’m talking about you) can be learned quickly. The grammar is relatively simple compared to many European languages. No neuter gender, throw out the case endings in spoken, 2 tenses, etc. All beautiful. 9. Language of Trade. With dozens of Arabic speaking countries, international trade is a powerful benefit for Arabic. The Arab world is quite lucrative to international traders, and speaking the language greases the wheels for sales and deals. 10. Understanding Islam. It is a fast growing religion, now the 2nd largest in the world. The beliefs and people are spread across the world. The religion and the language are very related. It has strong history with Christianity. Due to political and security reasons, understanding Arabic is now more important than ever before to help understand and communicate with the followers of Islam. 11. Rising Demand for foreign speakers of Arabic. 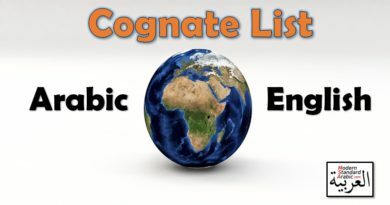 The world has a constant demand for foreign Arabic speakers in foreign affairs, defense, intelligence, journalism, media, trade and other important fields. Demand is high and rising, while supply is low. 12. Arabic is cool. Let’s face it, some languages are cooler than others. Arabic is hot, exotic and interesting. It looks cool, and the sounds are wild fun. 13. Set yourself apart. Many people stick to French, Spanish, English or more comfortable languages. Arabic will set you apart from the crowd, and set you on a path of becoming valuable and interesting in the international community. 14. Improve your Brain. Learning new languages, alphabets, systems and structures will help your brain and memory. 15. It will be fun. Sure, it will be hell as well. But there will be fun intermixed in there. Learn new types of humor, and discover the amazing sounding words along the way that put a smile on your mouth. 16. The food is really good. Some cultures come with crappy food. Arabic comes with awesome food. Go to a Lebanese or Yemeni restaurant, and you will see what I mean. 18. Boost your Confidence. Imagine the time when you are confident in your abilities, and you can say you speak and read Arabic. How rewarding will that be? No one said it would be easy… oh wait, I did above didn’t I? 19. Make more Money. Employers will pay you more money for your Arabic skills. You can also make more money on your own with your abilities. 20. Arab Hospitality. Utter a few sentences, or even just a couple words in Arabic, and native speakers will be interested in engaging you. This is NOT true for many world languages. The people are hospitable to those that show this consideration. Build rapport. Impress. Share the love. 21. Open your Eyes to new Culture. The window to culture is through the language. 22. Get more News from the Source. Rather than hearing your news filtered, get more news directly from the source in Arabic. 23. Find new friends, or a spouse. Arab people are fun, interesting and beautiful. Speak to them in their language, and you speak to their heart. 24. The people are migrating. Arabic will continue to spread as the people migrate around the world. 25. It is simply one of the most relevant and necessary languages today, any way you slice it. An outstanding share! I have just forwarded this onto a friend who was conducting a little research on this. And he actually ordered me breakfast because I stumbled upon it for him… lol. So let me reword this…. Thanks for the meal!! But yeah, thanx for spending the time to talk about this subject here on your internet site. Thank you, I have just been looking for info about this subject for a long time and yours is the greatest I have found out so far. But, what about the conclusion? Are you certain concerning the supply? Hi there! Someone in my Facebook group shared this site with us so I came to take a look. I’m definitely loving the information. I’m bookmarking and will be tweeting this to my followers! Fantastic blog and wonderful design. I was pretty pleased to find this website. I need to to thank you for your time for this wonderful read!! I definitely really liked every little bit of it and i also have you bookmarked to check out new information in your website. I’m impressed, I must say. Actually rarely do I encounter a blog that’s both educative and entertaining, and let me let you know, you will have hit the nail on the head. Your thought is excellent; the issue is something that not sufficient people are talking intelligently about. I’m very joyful that I stumbled throughout this in my search for one thing regarding this.